Thanksgiving has been celebrated, in one form or another, since the days of the first settlers at Plymouth. It was usually held on the last Thursday in November, but in 1939, President Franklin D. Roosevelt bucked tradition and moved Thanksgiving up a week. The country was still in the grips of the Great Depression, and the hope was that the move would give retail sales a much-needed boost. Not everyone agreed with his idea, and the decision caused an uproar and protests across the country. 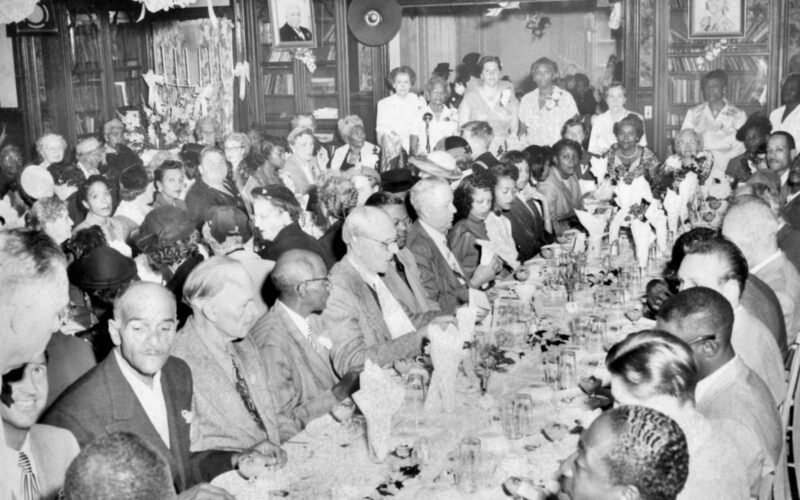 Father Divine, though, was a staunch patriot, and even though he didn’t agree with all of FDR’s programs — such as social aid — he went along with the new Thanksgiving decree. At that time in history, tens of thousands of people traveled across the country, often (illegally) by rail, to find work wherever they could. Most of these self-styled hoboes were homeless — and largely held in contempt by society. One of the group’s leaders was a man named Ralph Dalton, who became interested in Father Divine and the Peace Mission Movement. It was a dream come true for anyone who didn’t know where their next meal was coming from. Although this was a special occasion, Divine was well-known for hosting free, racially integrated meals. Divine would pass out bowls of food, pour coffee, and sit shoulder-to-shoulder with the participants. “Many of these persons who are known as ‘hoboes’ are men whose scholastic ability shows they have come from fine homes, and have had splendid educations. They are, by no means, all base and degraded. Many of them have been radical, with advanced ideas, and finding society a sham, unwilling to support them in their views, they have denounced society, and disinherited themselves from its connection, and have joined the ranks of other unfortunate and under-privileged persons, that they might live their own lives of freedom, unhampered by conventionality and tradition,” he told the diners that day. For those gathered, it was truly a day to be thankful.